1. Meal planning printable — This beautifully designed meal planning printable by Serif & Script Co. is only $5 on Etsy, and I was so thrilled to find it! I'm obsessed with all the prettiness in this shop, and recently spent a gift card on this print and the printable above. I tape a new one to our fridge each week to keep track of meals, shopping lists and other goodness. 2. Anker bluetooth speaker — Jay received this as a birthday gift earlier this month and I was probably as excited as he was. I've wanted a bluetooth speaker for ages (I'm a little obsessed with podcasts and audiobooks these days), so having one to use daily has been so fantastic! This one is beautifully designed and looks great in our kitchen (where we use it most) and works so well. We will be listening to more audiobooks and music during our homeschool routine, so this will come in quite handy with that, too. 3. 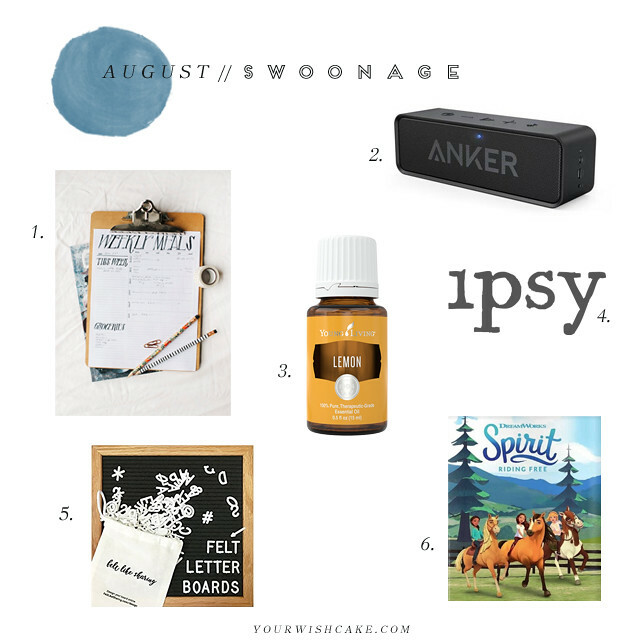 Lemon essential oil — For some reason, this summer has been the summer of mosquito bites in our house. Literally in our house. Rogue mosquitos keep sneaking in the front door when we go in or out and bite us for a couple days until I can find and squash them. And as well as regular ol' anti-itch cream works, I thought it would be better for everyone involved to act like a crunchy mama and come up with an essential oil concoction to alleviate the itching. The easiest solution I found? Lemon essential oil (I use and love Young Living) and fractionated coconut oil in a roller bottle. Jay, Eisley and I all use it and it has worked like a charm. Hallelujah! 4. Ipsy — Let it be known that I am in no way, shape or form a makeup maven. I am not fancy with my five-minute makeup routine, have no idea how to contour, and never wear bold lipstick. However, Ipsy is pretty much my new favorite thing. I signed up because I was able to get one free month with a referral from one of my sisters, so I figured I had nothing to lose. Five months later, I now consider it my little splurge every month! (Yes, $10 a month is a splurge for me, because I'm so weird about spending money on myself.) There hasn't been one bag that didn't have 3-4 items I still consistently use. My new favorite blush, brushes, mascara, eyeliner, and cover-up are all from Ipsy bags. I'm kind of amazed by the consistent greatness of such an inexpensive subscription bag, and I can't sing its praises enough! I feel like pretty much everyone already gets this bag, but if you aren't yet on board, feel free to sign up here. 5. Felt letter board — The fact that these letter boards are making a comeback makes my heart happy. I've wanted one for a while now, and was thrilled to receive one for my birthday! Although there are some beautiful options on Etsy, if you're looking for a more affordable alternative, you can browse the options from Felt Like Sharing on Amazon, which is where mine is from. I can think of a million ways to use this for decor and photo-ops, so I have no doubt we will be using it often! I kind of want to buy another one for the girls' room. 6. Spirit: Riding Free — It's been rather difficult to find decent TV shows for my 6-year-old to watch. We (happily) don't have satellite TV, so our options are limited to local channels, Amazon Video and Netflix. So, when I find a good show, I like to pass it along! Spirit is a newish series that is available on Netflix, and currently has one season up. I love that although the girls are older than my daughter (I believe they're around 12), they aren't boy-crazy, fame-obsessed, makeup-covered, sassy-pants girls. That said, the episodes aren't sugar-coated, and they tackle issues surrounding friendship, family and responsibility. Eisley isn't all that interested in horses, but still absolutely adored the entire season she watched. Do you have any favorites from this past month? I'd love for you to share!